There are differences in the proportion of target live weight (LWT) achieved between the main breeds of dairy heifers in New Zealand, suggesting a potential difference in growth pattern. The objectives of this study were to model growth curves of dairy heifers through random regression of Legendre polynomials, and to compare growth curves of the main breeds. Data comprised of 1,653,214 LWT records obtained from 189,936 dairy heifers in 1,547 herds. The fourth-order Legendre polynomial was the best at predicting LWT, with a relative prediction error (RPE) of less than 4% for the whole dataset and for Holstein-Friesian, Jersey and Holstein-Friesian-Jersey crossbred (F×J) heifers. The regression coefficients of the growth curve differed among breeds for the intercept (α0; P<0.001), linear effect (α1; P<0.001), quadratic effect (α2; P<0.001), cubic effect (α3; P<0.001) and quartic effect (α4; P<0.001). At all ages Holstein-Friesian heifers were heavier than F×J which were heavier than Jersey heifers (P<0.001). 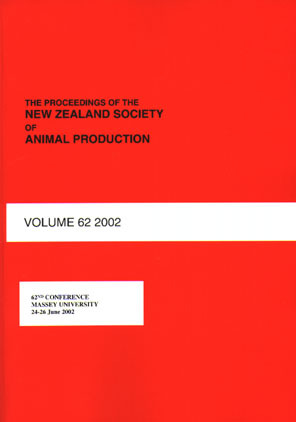 The percentage difference among the breeds varied throughout the growth curve, indicating that the main breeds of dairy heifers in New Zealand exhibited different growth patterns that were non-linear. The different growth patterns for each breed should be considered when formulating target LWTs and growth rates.